​The First 19-Numbers (0 to 18) Roulette with a House-Edge of 5.26%! Exciting and Space-Saving. Roulette-18® uses a (0 to 18) Roulette-Wheel and a unique Roulette-Layout. 1. 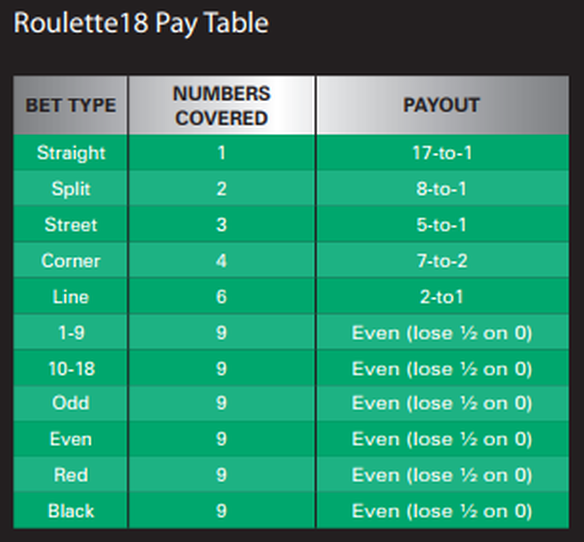 Players place their bets on the Roulette-18® layout which is similar to a Roulette layout but smaller. ​2. A 19-Number Roulette-Wheel numbered 0-18 is spin. 3. ​According to the winning number. Dealer then collects all losing bets and pays winning bets according to the Pay-table. Link-Bets are made possible by the addition of a fourth column which duplicates the first column. In other words while columns with 1, 2 and 3 existed, allowing for a split bet between 1 and 2 or 2 and 3, there is now a fourth column with number 1 again thus allowing for a split bet between the two adjacent numbers 3 and 1. The Double-Hit straight-up is a proposition bet based on two consecutive spin of the wheel. ​Patented and Registered Design. ©2012, All right reserved.